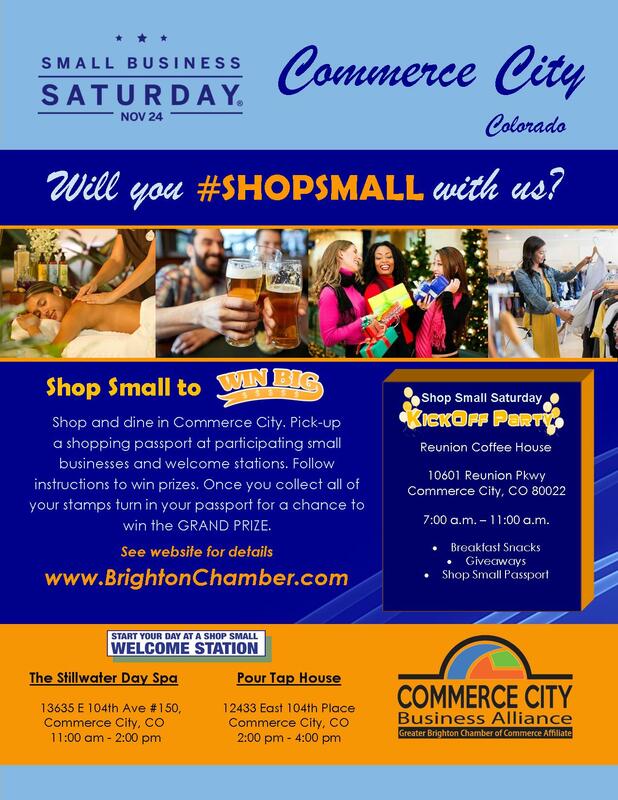 The Commerce City Business Alliance has been chosen as a Small Business Saturday Neighborhood Champion through the American Express Shop Small campaign. Small Business Saturday is about more than just shopping at small businesses. It’s a cause that helps support our local economy and promote a unique, vibrant, and diverse community. Small Business Saturday is a nationwide movement fueled by shoppers, business owners, and organizers who come together and celebrate the community because they know it matters. Small businesses play a key role in helping Commerce City thrive. By shopping or dining at your favorite local places throughout the year, you’re showing your support for small businesses and making a positive impact in your community. 1) Pick-up a shopping passport at participating welcome stations. 4) You will then be entered into the raffle for the GRAND PRIZE.